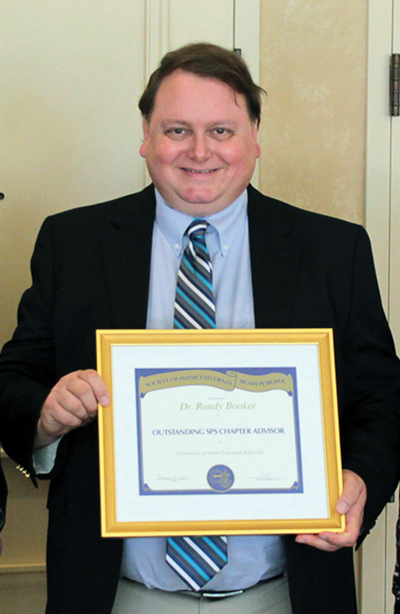 Randy Booker received his Bachelor's Degree in Physics from Rice University in 1979. He served as a Peace Corps Volunteer teaching high school math and science in Kenya from 1979 to 1981. He received his Masters Degree in Physics from Duke University in 1983. He then received his PhD in Physics from Duke University in 1986. His PhD thesis was on the millimeterwave rotational spectra of molecules found either in the interstellar medium of our galaxy or as pollutants in the Earth's atmosphere. He has taught Physics and Astronomy courses in the Physics Department at the University of North Carolina at Asheville since 1986. He served as Chair of his department from 2000-2010. He also has previously served as Zone Councilor for Zone 5 from 2004-2007. He has attended the 2004 and 2012 Quadrennial Physics Congresses that were held in Albuquerque, New Mexico and Orlando, Florida. Being an AZC was my first experience with the dynamics of making decisions and my first experience working with a large governing body. Previously I had believed an academic career could be devoted solely to research or teaching. But now I know that how an institution operates and shares limited resources with students and faculty impacts the ability of faculty to perform quality research and teaching. My AZC experience has helped me to participate in decision-making at my institution and advocate on behalf of grad students for increased pay, security, and better work conditions.